Back in the day, innovation programs were often separated from those of digital transformation (DX). Today – and most definitely, tomorrow – such separation makes no sense. If we think about it, at its core, innovation is about capturing new sources of value in new ways. DX is about the very same thing, powered by the range of digital technologies with implications on where you focus and how you execute. So, these are two programs critical to tie together. Doing so helps to speed impact, save resources, catalyze action, as well as help to “cross” that gap that so often exists between what gets done in one’s innovation programs and what gets executed on within a business. For both models, it’s vitally important that the programs deliver on the business outcomes they aim to realize. Therefore, revisit metrics around your program and adjust where necessary. A common approach to innovation metrics is the pipeline model where you look at the pipeline mix (in terms of the sources, categories, quality and quantity of ideas flowing into the pipeline), the pipeline productivity and health (the flow rate in terms of duration from initial idea to commercialization, and the amount of funding provided) and the business outcomes (in terms of increased revenues, reduced costs, increased customer satisfaction and so on). To align these metrics with your digital agenda, you may want to accelerate your average cycle time for commercialization and change the relative mix of what goes into the pipeline, what gets commercialized and how you measure it. Any corporate innovation program has to contribute to the delivery of desired business outcomes related to digital transformation. This means its focus must be adjusted in terms of the degree of innovation (i.e. disruptive vs. incremental) and the type of innovation (i.e. business model, process, products, services and so on). It’s likely your program already takes a holistic view across all these areas, so the change needed could simply be in terms of relative priorities. For example, if your existing program places equal emphasis on identifying and incubating highly disruptive ideas as well as more incremental ideas that can benefit your business, then you may just need to amplify the focus on the former. So, precisely what’s the right mix of disruptive versus incremental innovation to support digital transformation initiatives? There is no ideal mix since it will vary considerably from company to company and where you are in the “invest,” “sustain” and “harvest” cycle within your business strategy. However, this is an interesting area for board member discussions since it takes the innovation strategy of a company beyond the typical “innovate/maintain” investment mix discussion into specifics related to their more disruptive and transformative investments. Since the majority of digital transformation initiatives are focused on improving the digital customer experience, it’s important that the innovation program is driven by what’s meaningful to customers. There are many ways to accomplish this alignment ranging from customer-facing innovation workshops for collaborative innovation, to how you score and prioritize your innovation initiatives, to how you continually adjust your program based on customer feedback. Customers are typically interested in two fundamental areas of innovation. The first is innovation within the current scope of your companies’ products and services, and the second is in helping them with innovation above and beyond the current scope of your relationship. With regard to the second area of interest, what additional innovative ideas can you bring to the table to help them in their business? If your company is a B2C operation, then the equivalent question your customers may be asking is what else can you bring to them beyond your current product or service offerings? Going back to the innovator’s dilemma, they’re basically asking you about their unstated and future needs and providing a green light for you to collaborate. Typical growth horizons for an organization are described as horizon 1 (core products and services typically comprising 70% of the company’s annual investment), horizon 2 (emerging businesses and adjacencies typically comprising 20% of the company’s annual investment) and horizon 3 (new, transformational initiatives and “viable options” typically comprising 10% of the company’s annual investment). As product or service innovations gain traction and mature over time, they often move from horizon 3 where they’re initially incubated, to horizon 2, and then horizon 1 where they become a mainstream source of revenue. This may well involve a transition of these innovations from your innovation centers into the core parts of the business. As you transition these innovations to the business, it’s important to know your innovation leaders. You need to know who’s in the business, whether they’re pre-disposed to be innovative and if innovation is integrated into performance objectives. If all the above are in place, you measure the business and its leaders in terms of their ability to drive innovation. 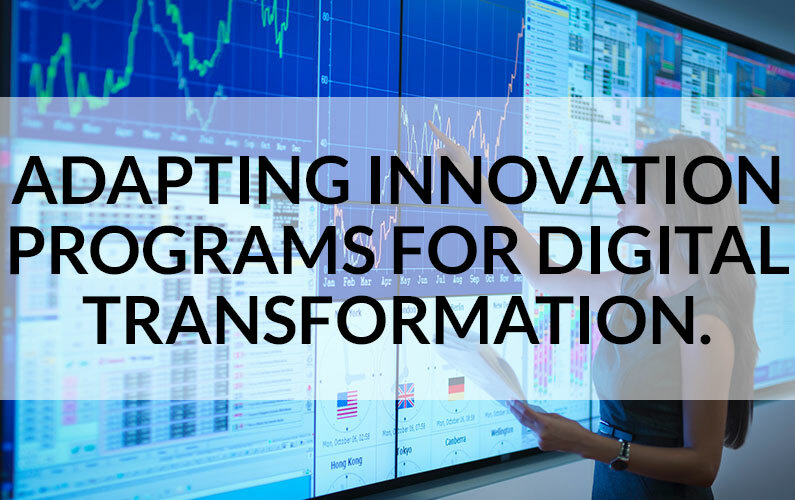 Finally, the innovation program itself has to be digitally transformed—leading innovation by digital transformation example. Just like any long-term initiative, it needs to continually evolve and adapt to meet the needs of the business. Elements of your innovation program may come and go year-over-year based on their level of adoption and benefits realized by the corporation. Examples are elements such as innovation portals, databases, communities, scouts and brokers. You can expect these to constantly evolve and adapt. The elements that have the best longevity are typically those that are designed to allow for intrinsic customization. As an example, innovation workshops that have a methodology and toolset designed to allow for a high degree of customization in terms of the key focus areas for each workshop can easily support a wide range of workshop topics and objectives over time. To digitally transform innovation programs, apply the same thinking that you apply to your externally focused innovation activities. For example, think about how the SMAC stack (Social, Mobile, Analytics and Cloud Computing) can enable stronger social collaboration, mobile access, improved analytics and cost-effective and agile cloud delivery. Create innovation processes that can be re-designed to be more customer-facing and produce results within faster cycle times. Taken as a whole, you’ll see that the innovation program must be re-visited in light of digital transformation objectives in terms of: 1. how it’s measured; 2. what types of innovation you focus on and their relative priorities; 3. where and when you create key touch-points with your customers; 4. which business unit leaders you collaborate with to drive innovation; and, 5. how you apply technology to transform your program’s capabilities. By assessing and then fine-tuning all these variables, you’ll be able to maximize your digital business outcomes in the years ahead. If you’re curious as to why ClearPrism as opposed to the larger management consultancies? Our philosophy is that if you’re interested in generating real results quickly, we believe that you don’t have to hire fifty people to get to the five or so smart people that actually perform the work. Just hire those five smart people directly and we’ll help you orchestrate to turn digital transformation requirements and expectations into reality. Have any questions or want to know more? Let us know or give us a call right now. Move beyond ordinary digital transformation. Move to predictable, sustainable digital transformation success, even in the era of disruption. Click here to call us now! Or, click the button for more information. CLEARPRISM does one thing. We help companies thrive in the era of digital disruption. We bring the right vision, execution and evolution of digital transformation that delivers predictable, sustainable business, customer and competitive advantage. We have the best digital transformation advocacy, project orchestration and continued optimization assurance. CLEARPRISM is your next step in digital transformation success. Legal & Privacy | © 2017-2019, CLEARPRISM, LLC. All rights reserved. Third party logos, documents, diagrams, text are property of their owners.